What Is The Firm Voice? Why Use Simpler Media Productions? Podcasters make for terrible self-promoters. It’s maddening. Who thought spamming community groups filled with other people making the same sort of stuff was a good idea? And why do so many of them keep doing it? So when I started Podcast Pontifications back in July 2018, I didn’t want to fall into that same trap. Even though my show was actually relevant to the podcasting community, I did the softest of soft launches in history. Because when I launched my show, it wasn’t even in podcast form. I rationalized my decision this way: The chance of my potential clients — professional service providers and business owners — not being a podcast listener was quite high. I work with people who don’t want to learn how to podcast. They just want one. And thus far, most of them are only casual consumers of podcast content at best. So I launched (?) my show as a video on Facebook Live, YouTube, and LinkedIn. You know; places potential not-yet-a-podcast-junkie-but-really-want-a-podcast-if-only-I-could-outsource-the-hard-bits-people were likely to hang out. And it worked. Hi, new clients! And thanks! But my podcasting buddies, many of whom I’ve been friends with since 2004, all had the same question: WHY THE HELL ARE YOU MAKING ME WATCH A VIDEO, EVO? WHERE THE HELL IS THE PODCAST VERSION? Even though I’m mostly immune to peer-pressure… my peers had a point. The topics I covered each day were quite different than most of what the other PAPs (podcasts about podcasting) were offering. My <10 minute episodes were each a nugget of podcasting insight that any/every podcaster would likely also like to ponder. And most any/every podcaster was (say it with me…) actively listening to podcasts. Though it would take some extra work on my end, it sure seemed like the benefits of having this future-focused, high-concept content delivered as an audio podcast every day would be an excellent and welcome (?) addition to the other PAP content that people were eagerly consuming. Fine. Now you can listen to Podcast Pontifications as a podcast. New episodes of Podcast Pontifications come out every Monday — Thursday. In less than 10 minutes, I challenge you to think about podcasting from a different perspective. Sometimes I’ll provide one vision of podcasting’s future based on changes to our industry. Other times I chip away at long-held (and flat-out wrong) assumptions on what it means to be a podcaster. Occasionally, there are clear action-items you can implement right away. But always, if I’ve done my job right, my contrarian views should help kickstart your own pontifications for your own podcast. Even if it’s one you haven’t started. Yet. And because I’m a professional podcast strategist, the show is available wherever you listen to podcasts. Just search for my name or the show’s. Or if clicking links is helpful, click away to Apple Podcasts, Google Podcasts, Spotify, and even a way to get new episodes delivered to you via email. I’m helpful that way. Hit that “Clap” icon a whole bunch of times. 50 is the max, and it only takes me 7 seconds to hit it that many times. See if you can beat my record. Share this (or the link to the show, or an episode, or whatever you like) with a friend who needs daily pontifications about podcasting to keep them moving/changing/questioning. You’ll be my best friend forever. 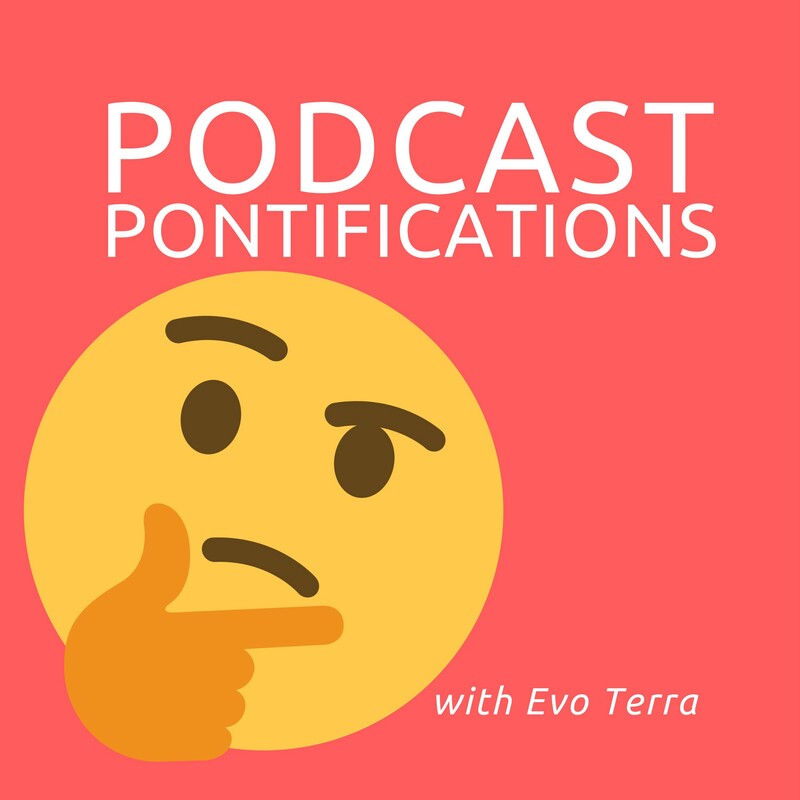 Evo Terra is has been podcasting before podcasting was cool. He runs a strategic podcast consultancy, which sounds very fancy. But in reality, Simpler Media launches podcasts the right way and keeps them running with best-in-class processes and people to keep professional service providers and business owners out of the technical weeds of podcasting. And you’d think that after writing Podcasting for Dummies and Expert Podcasting Practices for Dummies, he’d no longer write run-on sentences. You’d be wrong. Inspirational and actionable content to keep professional service professionals podcasting.